For the record, I don’t play Candy Crush. I know enough of its addictive quality from friends and acquaintances for me to even start. I have seen from their screens just how colorful the game can get, though, with candies forming vivid rainbow piles…and then getting crushed. Candy Crush’s colorful candies are reminiscent of my frozen yogurt experiences at Qoola Yogurt + Fruit over a year ago and just last weekend. With almost every colorful topping imaginable from fruit to chocolate and candy sprinkles, and with fro-yo of different flavors (read: different colors), I was in Candy Crush land. And, I certainly had fun crushing the candy toppings in my mouth. And because customers get to make their own yogurt and pick among the eye-popping array of toppings, I certainly felt like a kid in a candy store during my first visit that time at Qoola in Greenbelt, Makati. What ultimately sold me, though, was the decadent yema-flavored yogurt, a light caramel color like the real candy. 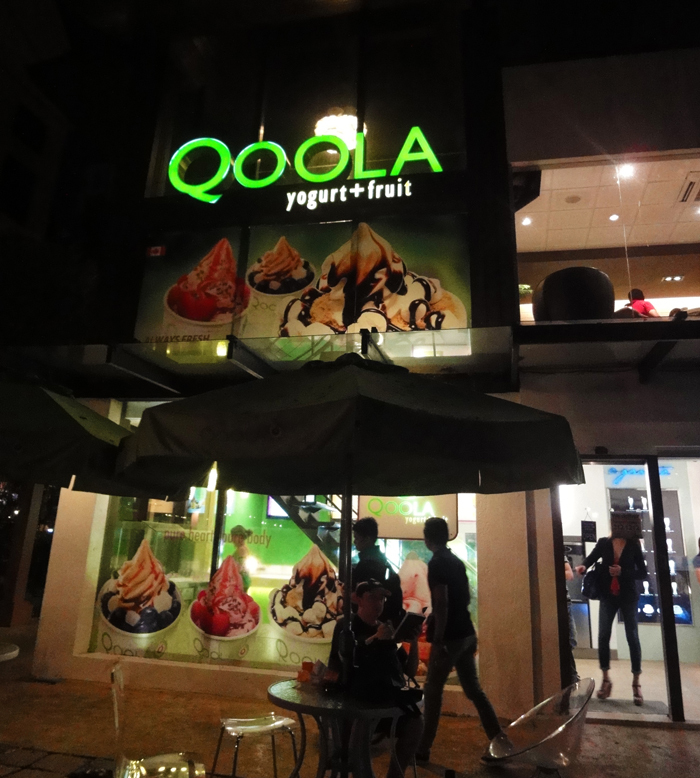 I wondered if Qoola could pull off yema flavor in a yogurt ice cream – after all, the first is sweet and the latter sour. But I was surprised – the caramel sweetness of the yema and the tartness of the fro-yo blended perfectly. It was by far the best fro-yo I had, and I had already visited five fro-yo stores before Qoola. Qoola changes its flavor offerings occasionally, and I’m just lucky I chanced upon yema that time. 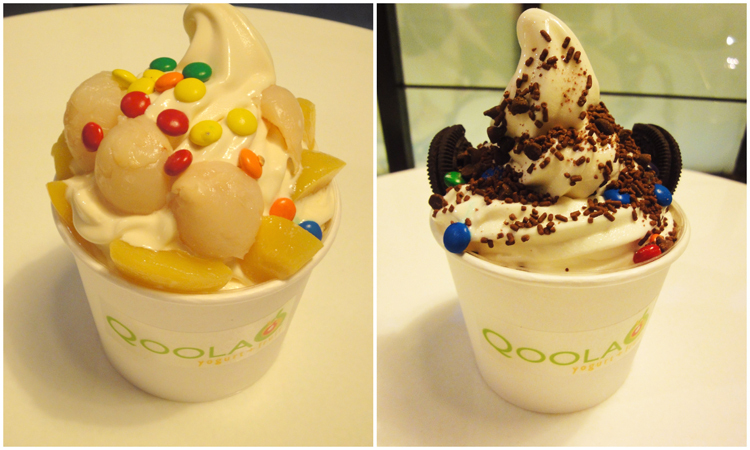 So, when I and other bloggers were invited for a fro-yo tasting last weekend, I was excited to taste Qoola again. Unfortunately, though, only two yogurt flavors were available during our visit – original and peach mango, with the latter just looking a tad more yellow than the original white. What I appreciated this time was that we were able to sample most of the toppings. The staff graciously prepared an all-fruit, an all-nut, a fruit and candy, and a cookie and candy yogurt. 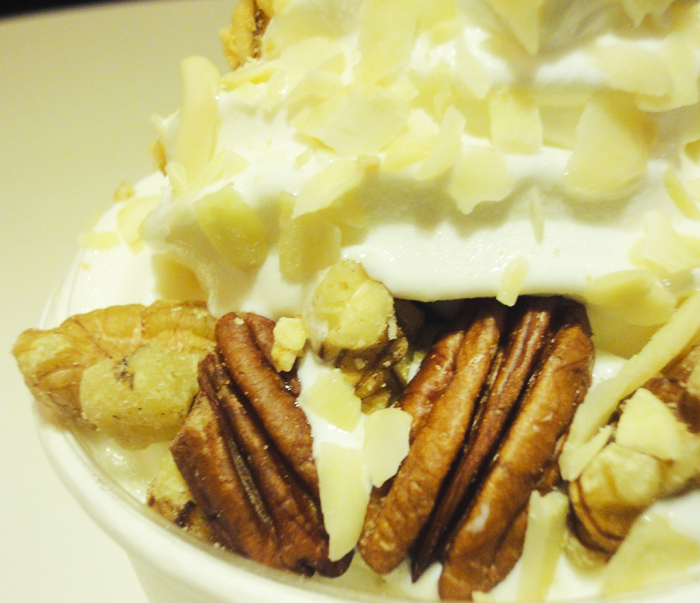 My clear winner is the original yogurt topped with pecans, walnuts, and almonds. The original yogurt is rightfully a mainstay at the store, as it has just the right balance of sourness and sweetness. The nut toppings’ subtle flavor perfectly complemented the yogurt. I was not too much of a fan of the all-fruit toppings, though. I love kiwi for example, but since the yogurt is already sour, and kiwi is also sour, the combination is a bit satiating (nakakaumay). Some more sweet toppings need to be added to balance the sourness. But for those who love sour, then the tart fruit and yogurt combination is not a problem. After I swooned over Qoola’s yema and was charmed by the original flavor, the peach mango flavor was kind of a letdown. The peach and mango taste were there, all right, but it was the fruits’ tartness, combined with the yogurt’s own tartness, that was dominant. It would have worked for me if the yogurt had more fruity sweetness, not sourness. But again, for those who like sour, this flavor may be just fine. All in all, though I would recommend Qoola among the many fro-yo places in Metro Manila, and not just because of the taste. Yogurt taste: Thumbs up for the original and yema, but not so keen on peach mango. Get a free taste first of the flavor you want to try to check if it suits your taste. Ingredients: Qoola claims to have fresh ingredients. 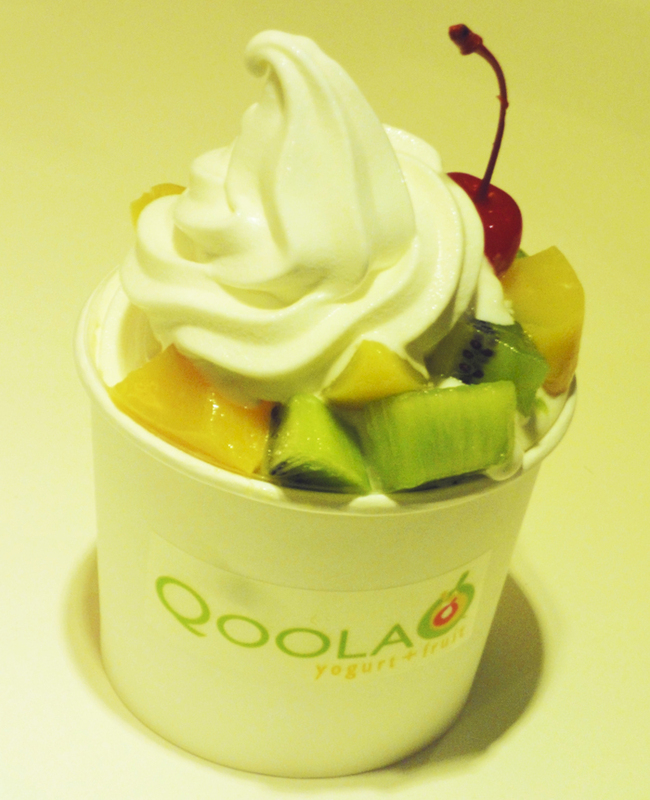 The fruits are particularly fresh and cut every day, which probably makes the store’s name Qoola Yogurt + Fruit. And yes, the fruit tasted fresh in our fro-yos. 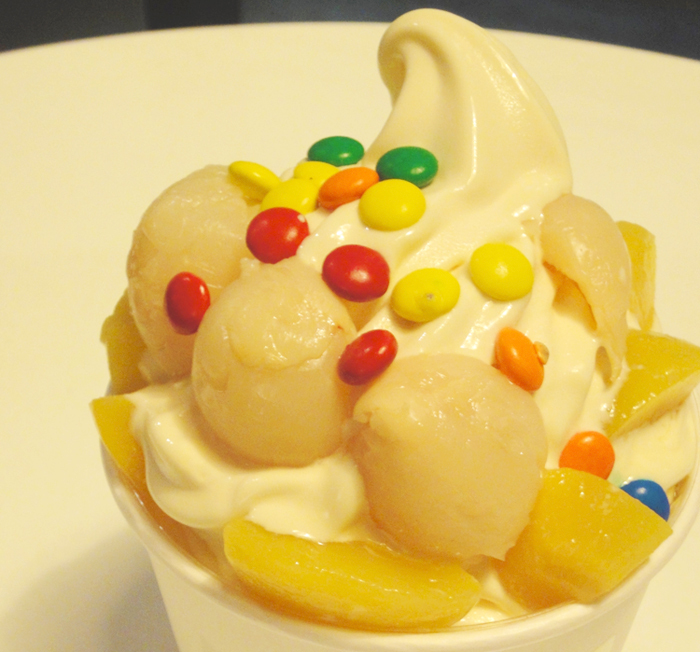 Variety: Think Candy Crush when it comes to toppings. There is just so much color and variety to choose from! Oh, and if variety means other offerings aside from yogurt, Qoola also offers waffles and crepes. Price: It is quite good value for money at Php68 per 100 grams. Since you make your own yogurt, make sure you estimate correctly and get enough yogurt and toppings according to your budget. I was too excited the first time and ended up paying more than I planned. Ambiance: Thumbs up for its green and white minimalist and sleek design and wide space – Qoola Greenbelt even has a second floor! And the view of the gardens from the second floor is not bad either. I also appreciate that Qoola is a stand-alone store and not inside the mall. Health factor: As a health-conscious pesca-vegetarian, I love Qoola’s values of keeping their food healthy. I particularly like that what I’m eating is GMO-free. For other health buffs, Qoola’s promise of gluten-free, dairy-free, and sugar-free may also be appealing. 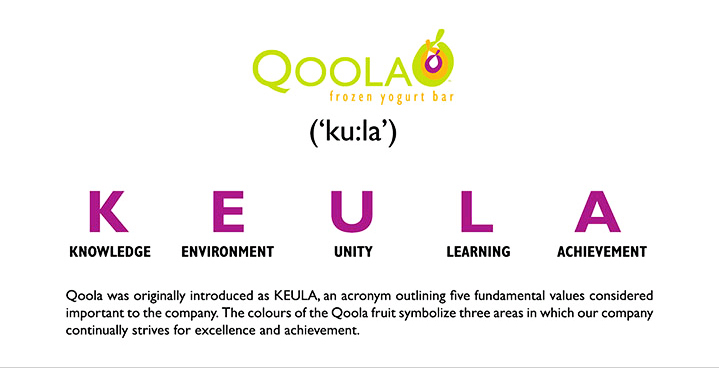 If you happen to be in Makati and are craving for great frozen yogurt, head over to Qoola. From the Keula fruit pala. 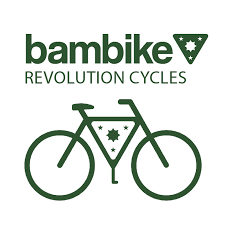 nice info. also nice shots, claire!